A small, powerful and lightweight ARM based computer. Introducing the new Raspberry Pi 3 Model B, the latest member of the Pi family. Delivering up to 10x the processing performance of the original Raspberry Pi and added connectivity with 802.11 b/g/n Wireless LAN and Bluetooth 4.1. The new board is not only great for learning to programme, gaming and hacks it’s now perfect for IoT projects too. Have you got everything for your Raspberry Pi? 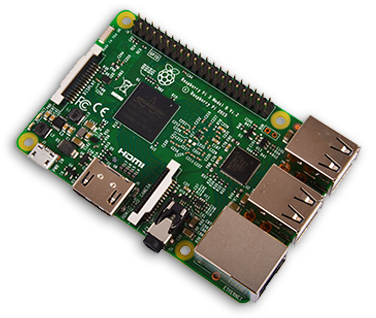 The next generation Raspberry Pi 2 Model B has 6x more processing power & 1GB RAM. Significant improvements over the original design, 40 pin GPIO, 4x USB & lower power. Like the Model B+ but a smaller form factor and uses even less power. The perfect small form factor Raspberry Pi for embedded designs. Add global wireless communications easily with the cellular development kit. The perfect case for your Raspberry P 3 Model B, 2 Model B and B . Over 8 million Raspberry Pi boards have been sold since they were first launch on the 29th February 2012. So why are they a worldwide phenomenon? Small in size and big on performance, each Raspberry Pi from the low power Raspberry Pi A to the powerful new Raspberry Pi 3 Model B provides a perfect mix of performance, cost and connectivity. At the heart of each board there is a powerful Broadcom SoC capable of running a variety of operating systems and programming languages from NOOBS to Windows 10 IoT. It’s not just millions of people on earth who are using their Raspberry Pi for programming, projects, hacks, products or teaching. From education to production lines the ease of use, support and versatility of the Raspberry Pi board allows anyone new to programming, experienced engineers or even astronauts to become involved with Pi. In February 2016 astronaut Tim Peake turned on his Astro Pi, a specially adapted Raspberry Pi with the Pi Sense HAT, and started coding in space. So wherever you are (even if you’re on a space station) get coding and inventing with your own Raspberry Pi. Based in the UK, the Raspberry Pi Foundation (registered educational charity number 1129409) aims to accelerate the education and improve the skills of children and adults in computer science, programming and related subjects. By introducing the credit-card sized Raspberry Pi, a low cost, powerful and easily accessible computer capable of running many programing languages including Scratch and Python, the Foundation has brought coding to a whole new generation of hackers, makers and electronics engineers. From browsing the internet to playing HD video the Raspberry Pi does everything you would expect a desktop computer to do. Manufactured in the UK under license by RS Components the Raspberry Pi comes in a number of form factors, from the powerful Raspberry Pi 3 Model B plus for any design project, to the Compute Module, with a small form factor and standard DDR2 SODIMM connector, ideal for industrial and Pi-powered OEM applications.